This is a discussion on Rakeback within the online poker forums, in the Cash Games section; I am a newbie in the world of Poker and I don't understand the term Rakeback. Could please provide some information on Rakeback? I am a newbie in the world of Poker and I don't understand the term Rakeback. Could please provide some information on Rakeback? Poker sites take a percentage of every pot played and you can claim some of this back.Not only will an affiliate site help you get more of your rakeback than sites generally give back by themselves.But an affiliate will also give extra with things like monthly rake races.Visit a rakeback affiliate site and read through.I use a site called RakeTheRake which is well respected and trusted and been around for decades.The best deals to be had will generally not be on the major sites.I use Betfair and get 55%-75% of my rakeback each month and it's still using the old contributed rakeback method.Which is superior to the new rpv rakeback deals to be had.So visit the site and take a look at the deals on offer. The rakeback on ignition seems to not be that great. PokerStars is better. Here is something that might help you understand the term, "Rakeback." This term originated online a few years ago, and it usually closely refers to how affiliates (read: partners or associates) get paid for helping poker rooms sign-up players or otherwise advertise for them. So to begin with the term "Rake." An online poker room usually takes a small commission from each poker game just for holding it. The online poker room usually does this through the dealer who takes a small percentage of the pot from each hand, e.g., 10%-14%, and that percentage is called a "Rake." So, a "Rake" is a "Commission." "Rakeback" is when an online poker room gives a percentage of its total "Rake" or "Commission" to the affiliates who advertise for, or otherwise promote, their business. The poker rooms normally digitally track the playing of these new players who signed up through their affiliates and then they pay back to their affiliates an agreed upon percentage based upon the rake they have gotten from these players. So, a "Rakeback" - simply stated - is a percentage of the "Rake" or "Commission." Cardschat, for instance, may be getting a "Rakeback" from the poker rooms that they promote - and, through the digitally tracked rake that poker rooms get from the players that joined them through Cardschat, But, I do not know this for a fact. Perhaps, I should go to Paris, and while there, I should ask the new owner of Cardschat if this is the case. But, I might not do so because the new owner of Cardschat prefers to remain anonymous for his own reasons at this time. Rakeback is for players - it is the wrong term to use for affiliates. This member is asking about rakeback for players. CardsChat does not have a new owner and the original owner is not anonymous and have no idea why you think you would find him in Paris. The rake is a commission taken by the operator of a poker game, such as a casino or an online poker room. The rake is typically less than ten percent, and the operator takes it from the pot each hand up to a certain limit. 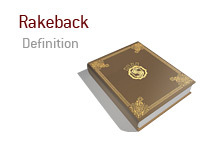 "Rakeback" is a relatively new aspect of raking that started with online poker rooms. As a form of incentive, the online poker rooms kick back a percentage of the rake based on how much a particular player contributed. Generally, rakebacks used a tiered structure: The more a player contributes, the higher the rate of the reward. Since the most loyal clients carry the greatest burden, the goal of this approach is to alleviate some of that burden. Most online poker players can easily save thirty percent of any rake they spend, and regular players can often save much more. In fact, rakeback is an important technique for maximizing an online poker player's bankroll. Another form of rakeback is the money given by online poker rooms to their affiliates. Affiliates are typically websites that advertise for poker rooms. Rather than pay per click or impression, the poker room tracks new player sign-ups, and then pays out to the affiliate based on the rake they collect from that player. PS: Please note the last three sentences. And, I have more research should it be required. Fair enough on the technical definition but it is definitely most commonly used in relation to players. I get a "gazillion" (obvious exaggeration) emails from sites and they don't use that term in regards to us. Experience in the forum makes me quite certain the member is interested in the definition as it relates to him.